India is one of the principal forces in the global push toward harnessing solar energy and a clear example of this is the on-going International Solar Alliance (ISA) Summit in New Delhi. At the summit, Prime Minister Narendra Modi introduced a 10-point strategy to make solar power more affordable for not just India but all the nations that participated in the summit. Modi also pledged that India will generate 175GW electricity using renewable sources by 2022. As of January 2018, the installed capacity of the Indian National Grid was 334GW, one-third of which is produced by renewable sources. The summit is a brainchild of the collaborative thinking of Modi and former France president Francois Hollande. 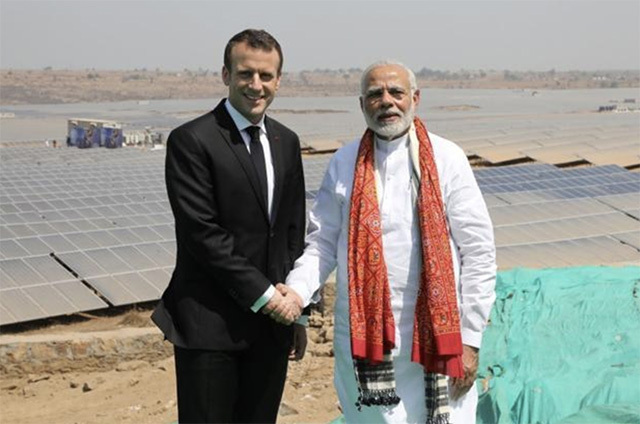 The current France president Emmanuel Macron, who is in New Delhi for the summit, said that his government will provide 700 million Euros (approximately $860 million) to help emerging economies develop a solid framework of solar energy. One of India’s union territory is already excelling at the production of electricity without any fossil fuels. According to a recent report, Diu has become the first district in India to derive 100% of electricity from the sun’s energy. More than 50 acres (0.2 square kilometers) of land is dedicated to solar power plants which generate 10MW while roof-top solar panels account for nearly 3MW of electricity. Since Diu is separated from mainland India, its electricity needs were fulfilled by electricity sourced from Gujarat. But, physical separation led to significant losses during transmission which inspired the UT to look for alternative sources of energy. Besides being self-sufficient in meeting its power demands, the UT has also been able to reduce the cost of electricity by nearly 33%. Meanwhile, the Solar Energy Corporation of India (SECI) also floated the biggest tender related solar infrastructure, calling out to corporations and key market players to invest in a 3-gigawatt power plant. The government also plans to launch larger tenders for capacities in the range of 30GW and is likely to invite bids for a total capacity of 77GW by the end of fiscal 2019-20.